Finola is a local business woman and a native of Carrick-on-Shannon. She received her primary and post primary education in Carrick-on-Shannon and a diploma in Religious Education from the Mater Dei Institute of Education. She is married to Pascal and they have four grown children. 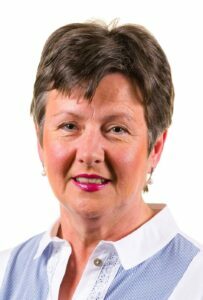 Finola has been an elected member of Leitrim County Council since 2014, and served as Cathaoirleach 2017/2018. Finola is very involved in the local community. She is a member of the Tidy Towns, and as a group they have managed to secure seven gold medals as well as County Title 2018. She is a member of the Board of Management of Scoil Mhuire, having previously been treasurer of St. Mary’s Boys School Board. She takes great pride in her local area and carries enthusiasm for raising local issues. She is committed to representing the people of her local electoral area to the best of her ability. She is determined, strong and is dedicated to securing funding to revitalise Carrick Town Centre. As a committed member of Carrick-on-Shannon Chamber of Commerce, she is also interested in the economic regeneration of the area and will strive to take action to promote business development and also to protect existing businesses to counteract challenges such as empty town centre premises.